We love hearing how many friendships are founded at SoulCycle. These riders clicked in class, bonded on the bike and built lasting connections. Check out these SFF stories, then share your own with us! WHERE THEY MET: At the “original Parker’s Party:” Parker’s 9:30 p.m. class on Tuesdays. SHOUT-OUTS: It’s almost impossible to walk into the class without getting a warm greeting from this crew. FESTIVE FRIENDSHIP: Besides the regular post-Soul drinks and birthday celebrations, the group planned a Secret Soul Santa last winter. 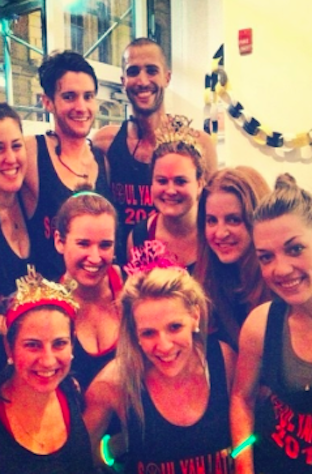 WHERE THEY MET: In Gabrielle’s 5 p.m. dance party class on Saturdays in Scarsdale. OFTEN SEEN… “Woo-hooing” at any point in class or clapping during jumps. LIFELONG LINK: The bond of these SOUL sisters extends beyond the studio. Rachel is following Julie and Andrea’s footsteps by attending the University of Maryland, where Andrea and Julie were sorority sisters, and Jamie is Gabrielle’s sister. Talk about SOULfamily! TRADEMARK TRAIT: “Outside of class, there is never a dull moment with this group and rarely a moment without obnoxious laughter,” says Kollmer. MEMORABLE MOMENT: “When Richard Fleming missed a class, and Ben said to the class, 'There is 90 percent chance that Richard is at a gyro stand on 15th Street right now.'" Have a SOUL story to share? Email blog@soul-cycle.com!